Order Custom TV Installation New York at low cost today in NY and NJ. Do you ever feel like your TV sticks out like a sore thumb or just doesn’t fit in with your room’s décor? To remedy that we offer custom TV installation New York services. TV framing is a way of seamlessly blending your TV into the design scheme of the room. We have an endless possibility of framing options for you. Feel free to scroll through our supplier’s websites to get some ideas. Let us transform your TV into a Mirror, Original Art, or even a Family Photo. Decorative flat screen TV frames integrate design with technology to blend seamlessly into any room. For designers and high end home owners, a Mirror TV can make your home a dream. We have access to some of the highest quality Mirror TVs out. A Mirror TV is a combination of a specialized 2-Way Mirror and High Definition TV. 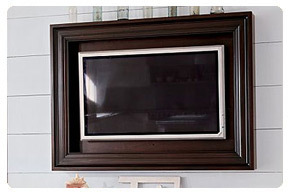 This type of TV is especially useful in a bathroom mirror or in a Jacuzzi area. If you are interested in the latest Mirror TV technology give us a call!